This shot was taken by Hans from Larry vs Harry the other morning. Sure, the bike lanes are, by and large, being cleared even though the repeated snowfalls are putting a strain on the city's logistics and budget. But since the bicycle is still the fastest way to get around - rain or shine - the citizens still use it. With this much snow the snowploughs clear a reasonable width but the strip is still narrower than the actual bike lane. If they have time they clear a wider strip but with the recent dump of snow there hasn't been. So single file it is. Lower speeds. Nice and easy. It's not a problem. It's only a few days out of the year. But my goodness what a single file. 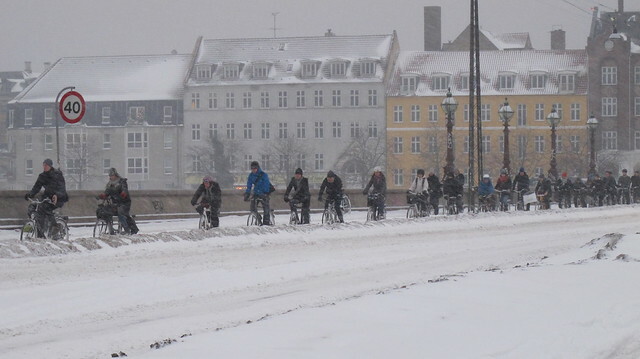 Hans said that it was easily three times longer than the group you see in the photo in the morning rush hour. Up to Blågardsgade, for those of you who know the city. And that was just this wave. The bike lanes on this street - Nørrebrogade - are being widened in sections and will be over 5 metres wide. But this is the busiest bicycle street in the western world.